The Mikoyan-Gurevich MiG-23 (Russian: Микоян и Гуревич МиГ-23; NATO reporting name: "Flogger") is a swing-wing fighter aircraft, designed by the Mikoyan-Gurevich bureau in the Soviet Union and is considered to belong to the "Third Generation" aircraft category along with similar aged Russian-produced fighters like the MiG-25 "Foxbat". It was the first Soviet fighter with a look-down/shoot-down radar and beyond visual range missiles, and the first MiG production fighter plane to have intakes at the sides of the fuselage. Production started in 1970 and reached large numbers with over 5,000 aircraft built. Today the MiG-23 remains in limited service with various export customers. As the Flogger A (MiG-23S/MS) was not that widely built or sold and had several major deficiencies in equipment, it is most likely that this kit is a Flogger B. Information on those versions is listed below. MiG-23M. This variant first flew on June 1972. It was the first truly mass-produced version of the MiG-23, and the first VVS fighter to feature look-down/shoot-down capabilities (although this capability was initially very limited). The wing was modified again and now featured leading-edge slats. The R-29-300 (R-29A) engine was now rated for 12,500 kg. It finally had the definitive sensor suite: an improved Sapfir-23D (NATO: 'High Lark') radar, a TP-23 infra-red search and track (IRST) sensor and an ASP-23D gunsight. The 'High Lark' radar had a detection range of some 45 km against a high-flying, fighter-sized target. It was not a true Doppler radar, but instead utilized the less effective "envelope detection" technique, similar to some radars on Western fighters of the 1960s. MiG-23MF ("Flogger-B"). This was an export derivative of the MiG-23M originally intended to be exported to Warsaw Pact countries, but it was also sold to many other allies and clients, as most export customers were dissatisfied with the rather primitive MiG-23MS. It actually came in two versions. The first one was sold to Warsaw Pact allies, and it was essentially identical to Soviet MiG-23M, with small changes in "identify friend or foe" (IFF) transponders and communications equipment. The second variant was sold outside Eastern Europe and it had a different IFF and communications suite (usually with the datalink removed), and downgraded radar, which lacked the electronic counter-countermeasure (ECCM) features and modes of the baseline 'High Lark'. This variant was more popular abroad than the MiG-23MS and considerable numbers were exported, especially to the Middle East. The infrared system had a detection range of around 30 km against high-flying bombers, but less for fighter-sized targets. The aircraft was also equipped with a Lasur-SMA datalink. The standard armament consisted of two radar- or infrared-guided	Vympel R-23 (NATO: AA-7 'Apex') BVR missiles and two Molniya R-60 (NATO: AA-8 'Aphid') short-ranged infrared missiles. From 1974 onwards, double pylons were installed for the R-60s, enabling up to four missiles to be carried. Bombs, rockets and missiles could be carried for ground attack. Later, compatibility for the radio-guided Kh-23 (NATO: AS-7 'Kerry') ground-attack missile was added. Most Soviet MiGs were also wired to carry tactical nuclear weapons. Some 1300 MiG-23Ms were produced for the Soviet Air Force (VVS) and Soviet Air Defense Forces (PVO Strany) between 1972-78. It was the most important Soviet fighter type from the mid-to-late 1970s. Not what one would consider a cutting edge design in today's market. But when it first appeared in the mid/late 1970s, it was very much the norm with raised panel lines and fairly good detailing for the time. One must remember that during these heady days, it was not uncommon for a model company to provide a new-mold kit release or two every month. Of course, in today's economy that is not always possible, but things have changed; and from my perspective, most of it is for the better. 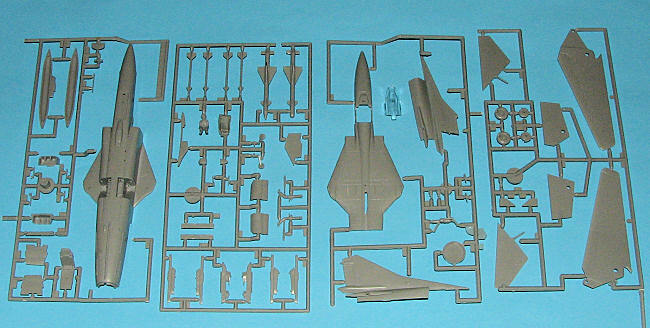 The fuselage is split into upper and lower halves as befits a model of an aircraft with variable geometry wings. A Spartan cockpit consisting of little more than floor, seat, control stick, pilot (to help fill the space) and instrument panel are supplied. This isn't a major problem as the one piece canopy is a bit thick. There is more than enough room in the nose for the required weight. The swing wings are connected by a simple bar and if one doesn't play with it too much, it should be sufficient. The tail section is an unusual construct as the upper rear fuselage is incorporated with each fin half. A connector bar is provided for the horizontal stabilizers, which need to be installed when the fin halves are cemented together. This makes them prime targets for breaking off when one fills the inevitable seam between the upper and lower rear fuselage. Landing gear are fairly well done and sturdy. The main wheels have a notch in them for the mud guards while those for the nose are molded in place. Lower fin is designed to be molded in the folded position as would be the norm while on ground. For things under wings, one has a centerline fuel tank and the option of various missiles on the wing glove and under fuselage. These have some sink marks on the pylons and ejector marks on the missile bodies. A centerline gun is also provided. Instructions are well done with Humbrol paint references. Decals are nicely printed and are matte with relatively large clear surrounds. They are for two aircraft, both of them in the multi-colored camouflage as shown on the box art. No unit information is provided, but one is for a Soviet and the other a Polish aircraft. 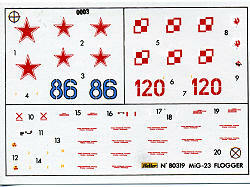 The markings guide shows insignia on the upper wing of the Polish aircraft which may not be prototypical so some research may be needed. I'll be the first to admit that Soviet aircraft are not something that I see a lot of on contest tables. It seems that their jets are not hugely popular in the US as kits of them can often be found deeply discounted on vendor tables. This is good news for a modeler on a budget as the kits are not that bad and can easily be made into very nice representations. That would include this one. If you see one at your next show, plunk down a few dollars/euros/quatloos and pick it up. Thanks to the kind donation of friends for this one.